I have seen a lot of Beekeeping signs and made a few myself, especially for when I am catching a swarm in a public area as people do let their curiosity overwhelm then sense sometimes. First up, Beekeeper Parking sign, speaks for itself. Also from Rossman Apiaries in the US is this one, How Fast Can You Run?, I have called it. I think that these signs will always have more impact on casual readers when there is a little bit of humour and a little bit of drama in them. Next up, I really like this Warning - Africanised Bees sign from the USA. Not the kind of thing you are likely to see in the New Forest where I live, I am pleased to say, but good advice on here! As ever, as bees, they are attracted to fast movement and if you run, they will chase - if you walk slowly and calmly, they will probably leave you alone. The next one is not so much a warning as a request - No Spraying Please! - it would be good to think that your neighbours would consider your apiary if they knew it was there. I always worry about putting signs up like this that advertise specifically where your apiary is located, due to hive-thieves, though. It's a difficult balance. One from the UK! Nicely done, this clear and largely graphical sign just gives passers-by the idea that approaching those lovely looking bee hives might not be the best idea for them or the bees. Hats off to the authorities in Australia for producing this sign for local beekeepers to use in and near their apiaries to promote and improve apiary hygiene and Honey Bee Biosecurity. Some great info on their site too, check it out. 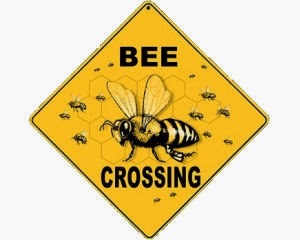 This would be an incomplete collection without a Bee Crossing sign, so here you go. 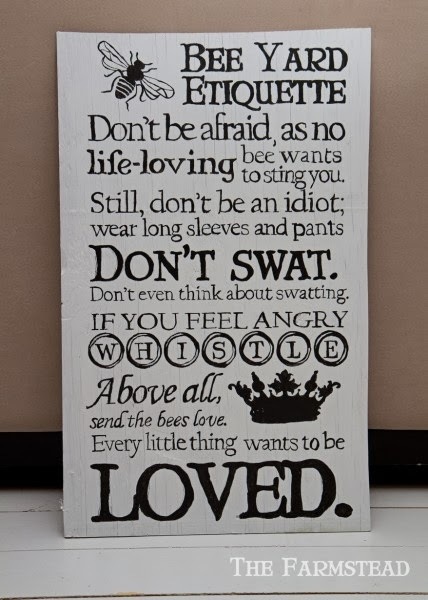 My favourite of all is this one, and it is free (or at least the instructions on how to make your own) from the Farmstead, the Bee Yard Etiquette. I plan to build myself a beekeeping shed next year and when I do, I shall make one of these to hang in it. Beautiful, funny and practical. ...please do comment with a link to any others you have seen and would like to share with me. Thanks. We mentioned this post on our latest podcast, hope you enjoy the show. I heard it! Thanks Gary - I hope to get more on here now work has calmed down a bit! Still loving your podcasts, mate. Do you recall where you viewed the ' Look out bees about' sign' ? Sorry for the slow response - it was on a UK Gov website, I can't remember which one, but it seems to have been removed as I cant find it any more on any site other than this one and Pinterest! If I find it again I shall provide a link. Hi, a very late reply but the UK 'Look Out, Bees About' sign was actually designed by me. It was for my local beekeeping association - I'm also a beekeeper myself. There were a limited number made for various apiaries. Bee Yard Etiquette Plaque, is this a DIY sign? Do you know where I could buy it already made please?